Washington: Don't want to be confronted with the number of calories in that margarita or craft beer? Then avoid the menu and order at the bar. New menu labelling rules from the Food and Drug Administration will require chain restaurants with 20 or more outlets to list the amount of calories in alcoholic drinks, along with other foods, on menus by next November. The idea is that people often don't know — or even think about — how many calories they are imbibing. But the rules don't apply to drinks ordered at the bar or any drinks that aren't listed on the main menu. The wine list will also be guilt-free — individual calorie amounts aren't required there either. And unlike other beverages and foods, most bottles and cans don't have to list full nutritional information. The FDA's proposed menu labeling rules in 2011 exempted alcohol. But FDA Commissioner Margaret Hamburg said the agency decided to include it in the final rules this year after those who commented on the rule were largely in favor of such labeling because of its potential impact on public health. The beer, wine and spirits industries objected, arguing that they were regulated by the Treasury Department, not the FDA, a setup that dates back to Prohibition. Treasury's oversight, which includes minimal input from FDA, has "well served the consuming public," a coalition of alcohol groups wrote in a 2011 comment asking to be left out of the menu labeling rules. 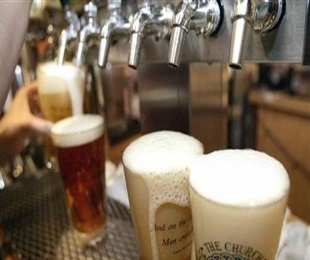 The new rules are designed to not be too burdensome for the alcohol industries or restaurants. Endless combinations of mixed drinks won't have to be labeled at bars, unless they are listed on a menu, and the FDA is allowing restaurants to use estimates of calories and ranges of calories without listing the exact amount in every different drink. That means menus will list the average amount of calories in a glass of red or white wine, but won't list calories by every brand of wine on the wine list. Same with beers and spirits. So every winery or craft brewery won't have to pay to have their products' nutritional content analyzed — for now, at least. The regulations "could have a slight chilling effect" on small breweries if some restaurants decide to go beyond them and list calories for individual beers, said Paul Gatza of the Brewers Association, which represents craft breweries. The rules could have advantages too, he said. "The more customers know about a brewery, the more they feel connected with it," Gatza said. Off the menu, labeling rules appear further away. Last year, Treasury's Alcohol and Tobacco Trade and Tax Bureau said for the first time that beer, wine and spirits companies could use labels that include serving size, servings per container, calories, carbohydrates, protein and fat per serving. The labels are voluntary and will likely be used mostly by liquor companies touting low calories and low carbohydrates in their products. Wine, beer and liquor manufacturers don't have to list ingredients but must list substances people might be sensitive to, such as sulfites, certain food colorings and aspartame. Tom Hogue of the Tobacco Trade and Tax Bureau said the current goal is to make sure that companies that want to label may do so, and that labeling is consistent. It is important that labels "don't mislead the consumer," he said.